What is the fairway on a golf course? Such a simple question, and anyone who golfs knows the answer intuitively. But is there an agreed-upon definition within the golf world? You might be surprised to know that the governing bodies and keepers of the rules of golf, the USGA and R&A, offer no definition of "fairway." The fairway is the closely mown area that runs between the tee box and putting green of a golf hole, and is the target for golfers on all holes other than par-3s (where you take aim at the green). Another way of stating it: The fairway is the ideal landing area for shots off the tee, and is the pathway that leads the golfer from the starting point of the hole (the teeing ground) to the end point (the hole on the green). The grass in the fairway is cut very short (it is "closely mown," in the parlance of the golf rule book) and because the rough on a hole is higher than the fairway grass, the rough often "frames" the fairway. That means the fairway stands out (usually) as the obvious connector of the teeing ground to the putting green. Fairways are always included on par-4 and par-5 holes, but may be absent from par-3 holes (since those are short enough that the golfer's goal from the teeing ground is to place the golf ball on the putting green). Since the fairway is an extremely important part of a golf hole, and the term "fairway" is ubiquitous in every golfer's lexicon, it is surprising that there is no official definition of the term in the Rules of Golf.
" 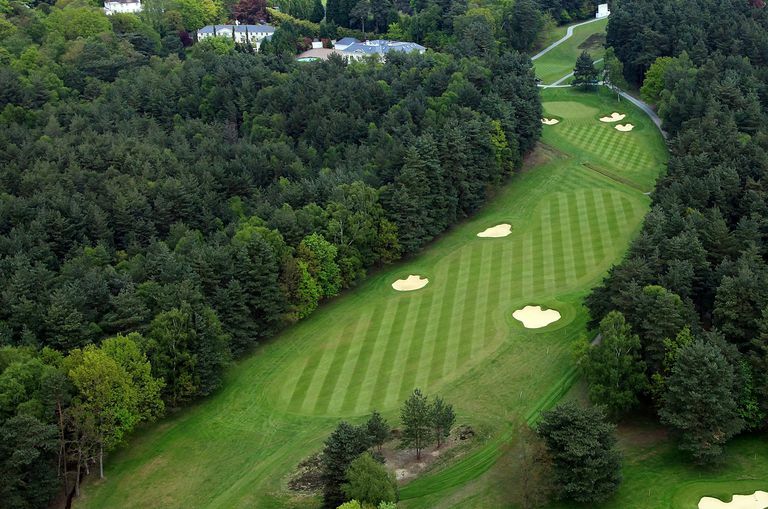 'Closely-mown area' means any area of the course, including paths through the rough, cut to fairway height or less." Why does such an important term as "fairway" go almost completely unused in the rule book? Because the governing bodies use another term—"through the green"—that encompasses both fairway and rough. And "through the green" is used frequently in the rules. So anytime you see the term "through the green" used in relation to golf, just think "fairways and rough." "... fairways are those areas of the course that are mowed at heights between 0.5 and 1.25 inches, depending on grass species and the cultural intensity desired. Fairways normally are about 50 yards wide but vary from about 33 yards to more than 60 yards, depending on the caliber of the golf course involved and limitations imposed by architecture or terrain." Ralph Dain, a field rep for the GCSAA, says most fairway grasses are maintained from 3/8 to 3/4 of an inch. The fairway height at any specific course depends on the type of grass in use, soil conditions, local weather, player expectations and golf course budgets (maintaining lower fairway heights is more costly).